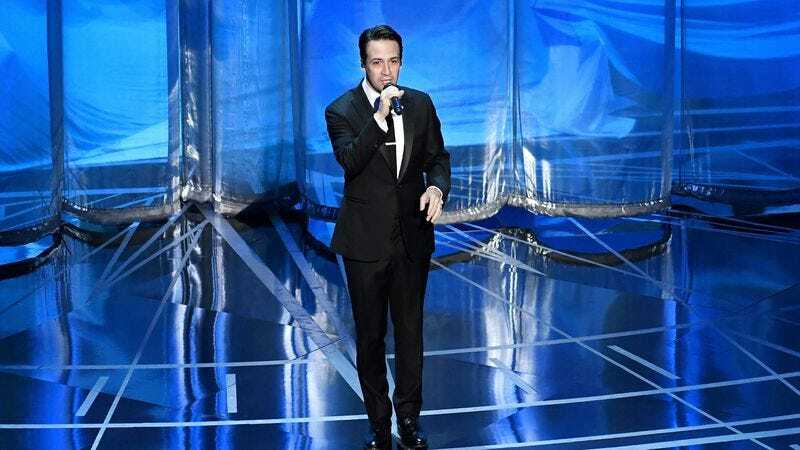 The Academy wasn’t going to pass up the opportunity to have Lin-Manuel Miranda on stage, regardless of whether or not he wins the prize for Best Original Song. (That has yet to be determined as of this writing.) And so Miranda composed a prelude for the performance of his nominated track from Moana, “How Far I’ll Go.” In rhyme, he “set the scene” for 16-year-old Auli’i Cravalho to start belting out her big number from the film. “Picture a young warrior not even 17, she dreams of open seas,” he explained. Hey, it was certainly better than John Travolta‘s introduction for a Disney “I want” song. Miranda then stepped aside and let Cravalho have her moment: Her bright-eyed optimism could not even be deterred by a dancer’s errant blue flag, which grazed her head while she sang.